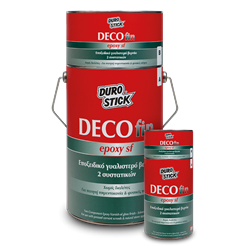 High strength, two component gloss epoxy varnish, without solvents. It is highly resistant to abrasion, acids and alkalis as well as chlorinated and salt (sea) water. It creates a hard, non absorbent and completely sealed surface. The cured product does not promote bacteria growth on its surface and is suitable for areas with strict hygiene requirements. Ideal for applications in swimming pools, and fountains. It is suitable for kitchen countertops, and commercial kitchens, catering halls, restaurants, hotels, and entertainment venues etc. Due to its exceptional surface hardness, it is suitable, as a brushable coating, for floors with demand for high mechanical and/or even chemical resistances. Classified SR-B2,0-AR0,5-IR4 per EN 13813. 200-300gr/m² per coat, depending on the absorbency of the surface.